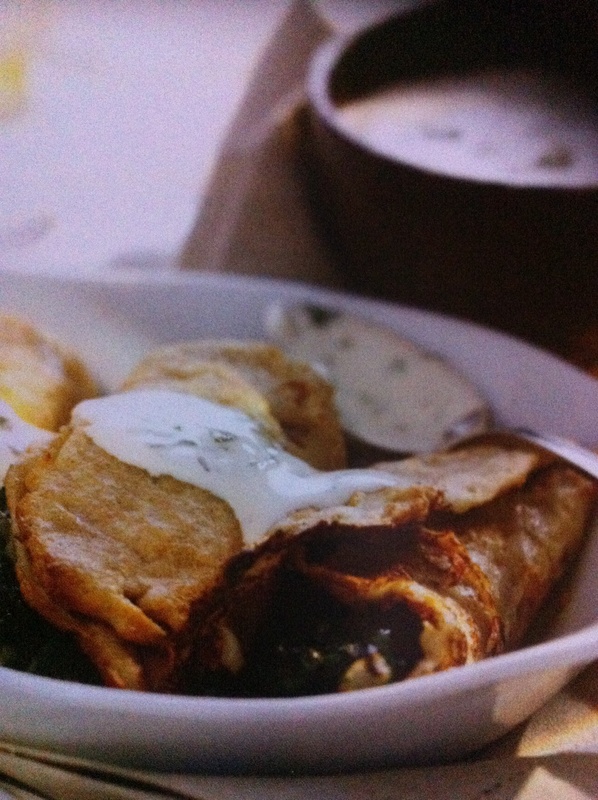 These crepes are incredible versatile and can be filled with a wide range of vegetables, dried beans and nuts. Stuff them with a little leftover stew and you’ve got a great meal for the family. They are also delicious with sweet fillings such as banana and maple syrup, but add 2 teaspoons of sugar to sweeten the batter. If making crepes for breakfast, make the batter the night before and keep it in the fridge. To make the crepes, whisk together the egg replacer and the water until frothy. Whisk in the other ingredients. Lightly oil a 22 or 25 cm (8 or 10 inch) cast iron or heavy non-stick frying pan and place over medium-high heat. Once hot, pour in about 2 tablespoons of batter. Swirl it around so it forms a thin layer on the bottom of the pan. If the mixture doesn’t swirl easily, add a little more non-dairy milk to the batter. Cook the crepe and once the top is dry and the underside very lightly browned, flip and cook the other side for 15 to 30 seconds – the finished crepe should be lightly browned but without crispy edges. Stack the crepes as you make the and keep warm, covered with a clean tea towel. Cook the spinach in just the water clinging to the leaves until it is just tender; drain, cool and roughly chop. Heat the oil in a saucepan, then add the onion and cook for 5 to 7 minutes unit is is soft. Add the root ginger and spices and cook for 1 minute. Stir in the spinach and turn to coat in the spices. Preheat the oven to 220’C (425’F/7 Gas). Place a generous amount of filling down the centre of each crepe, roll it up, then arrange in an oiled baking dish. Meanwhile, combine the sauce ingredients and serve with the crepes (You can also make and fill the crepes in advance and keep them chilled until ready to bake). Prepare the basic recipe, using 125 g (4 oz) plain flour in place of rice and buckwheat flours. Or use 60 g (2 oz) each of plain flour and wholemeal flour. Prepare the basic recipe, using the roasted vegetables from the Mediterranean Warm Vegetable Wrap in place of the spicy spinach. Serve with the minted yoghurt sauce, if desired. Prepare the basic recipe, using the mushroom filling from the Mushroom Lasagne in place of the spinach.